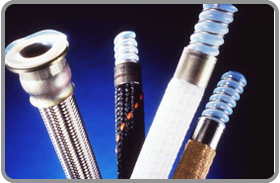 PTFE has the lowest friction coefficient of any solid material. No stick-slip movement occurs since static and dynamic friction coefficients are approximately equal. As the load increases, the friction coefficient decreases. These properties are utilised for pipe slide bearings, pot bearings & bridge bearings that require high load support. In pipelines which transmit heat or are subject to wide changes in ambient temperature, changes in pipe length sometimes generate considerable forces which act on fixed points like pump fittings. It is often very costly and difficult to provide means of compensating for these forces. Special bearings can be fitted with PTFE slide elements recessed into steel to prevent cold flow of PTFE. As a result of this recessing, loading pressures up to 500kgf/cm3 can be absorbed. Alternatively the PTFE can be chemically etched for bonding with an adhesive system. For the mating element, stainless steel sheet at least 1mm thick is used, e.g. Material No. 1.4401 (DIN 17440). The maximum roughness depth (R) (DIN 4762) should not exceed 3-8 µm. The surface hardness of the stainless steel sheet should be at least Vickers hardness 1 = 130 kgf/mm2. In certain cases other materials, like acetal resin, can be used as the mating element instead of stainless steel.